Do all creative writers like to cook? I certainly do. Cooking feels as creative as writing, even for something as mundane as making dinner every night. Last week, I decided to combine a little craftwork with cooking (or rather heating and stirring, it wasn’t that taxing) and came up with these very cute bottles of white chocolate liqueur for my sister’s birthday. I got the recipe from Prima, but I did find as I made it that I needed to do some adjustments to the basic recipe. The recipe I had suggested simply heating double cream and condensed milk together until just about to boil. Anyone who has ever made caramel for millionaire’s shortbread will know that it burns really easily so slow, gentle heat and continual stirring is a must. Anyway, here is the recipe. Enjoy! 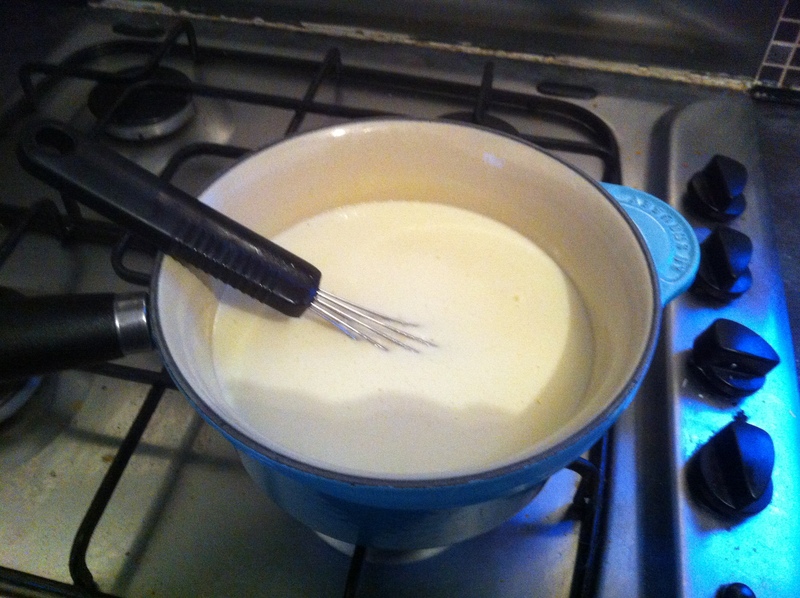 Place the double cream and the condensed milk into a saucepan and slowly bring to the boil, stirring frequently (otherwise the condensed milk will stick and burn). Put the finely chopped white chocolate into a bowl and pour over the hot mixture. Mix well until it has all melted. Leave to cool for five minutes. Pour in the white rum and mix well to combine. Allow to cool completely. Pour into sterilised bottles, seal and store in the fridge. Will keep for up to a month. I got my little bottles from Miniature Glass Bottles.